The urban environment influences health, well-being and quality of life. For urban development, this is only one target area among numerous others such as, for example, sustainability, social justice and economic well-being. In the debate about urban priorities and perspectives, the most varied values, interests and ideas of solution are brought together. This represents a significant challenge for all stakeholders. General information about the topic “UrbanHealth” can be found under the corresponding tab of the menu bar (e.g. : Relevant topic aspects, involved disciplines, sectors and actors as well as examples of successful transdisciplinary projects). 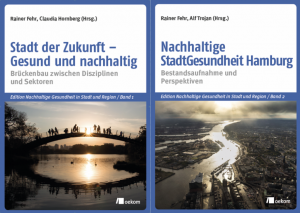 Cross-sectoral and transdisciplinary cooperation is the starting point of the funding program “City of the Future – Healthy, Sustainable Metropolises”, which is funded by the Fritz und Hildegard Berg-Foundation (German Center for Foundations, Essen). This program is designed to contribute to the cooperation of different disciplines and sectors in theory and practice. Under the same named menu tab, the Research Program is presented. In addition to directly program matters, there can be found information on the research groups and projects which have been funded up to now, as well as on the conferences organized under the program. Furthermore there are numerous other conferences, competitions etc. with contact points on the subject of “Urban Health”. We have sum up a selection of appointments for you on the right in our Calendar. A large part of the calendar entries is linked to the external event websites. These external websites are in the sole responsibility of their operators. Therefore it is possible that such links are no longer available after the event has ended. We would be pleased to receive appropriate proposals for events and invitations to tender for the calendar. Our Contact data can be found under the corresponding menu tab. We look forward to your constructive criticism and suggestions.